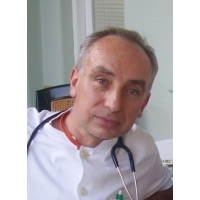 Tomislav Maretić is a physician, a specialist for infectious diseases and he was working almost 40 years in University Hospital for Infectious Diseases in Zagreb. He lives in a little place near Zagreb City with his wife Ana and four children (age 21-27). He is retired as MD, but still works part-time in Čakovec - a little city at north of Croatia. He plays guitar in a jazz swing amateur band and loves to cultivate his garden (especially tomatoes!). He has been writing haiku for forty years. His haiku have received several awards and prizes and were published in several journal and magazines, online and in print, e.g. Ko: Haiku Magazine in English, The Heron's Nest, World Haiku Review, The Asahi Shimbun,The Mainichi Shimbun, Frogpond Journal, Modern Haiku, Azami, Red Moon Press, Bottle Rockets Press and many others. Awards and Other Honors: First place - Haiku Contest of Azami haiku magazine Tokyo, 1998; Grand Prix, 2nd  Vladimir Devidé Haiku Award 2012; Shiki Monthly Kukai, 2013 and 2015; Second place - The First Yugoslavian haiku contest, Vršac 1989; Basho Haiku Festival, Iga City, Japan, 2013; Third place - International Kusamakura Haiku Competition, Kumamoto, Japan, 2000; Honorable Mentions -  ITO EN Oi Ocha New Haiku Contest, Japan, 1991, 1992, 1993; 1995; 1996; 15th International contest  Honolulu, Hawaii 1992, 1999;  Haiku Contest of Azami haiku magazine Tokyo; 1998; Simply Haiku: Winter Kukai, 2004; 2009; Romanian Haiku Contest, 2007; 14th The Mainichi Haiku Contest, 2010; Vancouver Cherry Blossom Festival, 2011; The 19th Mainichi Haiku Contest, 2015; 20th Mainichi Haiku Contest 2016; 6th Japan-Russia Haiku Contest (English Section), 2017; Merit Awards - Sakura Award Haiku Vancouver Cherry Blossom Festival, 2006 and 2008; 6th Matsuyama International Haiku Contest - Excellent haiku Award, 2017; ITO EN Oi Ocha New Haiku Contest, Japan 2001, 2016; The 6th Mainichi Haiku Contest, Japan, 2002; World Haiku Review Vol. 6 Issue 3 - May 2008, WHC Showcase Tokusen poems of special merit; Fifth Annual Suruga Baika Literary Festival, Japan, 2017; World Haiku Review, August 2017 and March 2018; Commendations: Highly Commendable, Vancouver Cherry Blossom Festival; 2006; Runner-up - Vladimir Devidé Haiku Award, Osaka, Japan, 2011 and 2014; The Golden Triangle haiku contest 2015, 2016, 2018. Certificates Haiku Euro Top - Top 100 haiku poets in Europe 2011-2017. Books: Naplavine - free style poetry; Felsina & T. Maretić, Zagreb, 2002; Leptir nad pučinom (Butterfly over the Open Sea)  - haiku; Hrvatsko katoličko liječničko društvo, Zagreb, 2011; Šešir pun uspomena - haiku, Biblioteka ,,Posebna izdanja", Knjiga 5, Vlastita naklada Đuretić, Zagreb 2012; Nebo u rukavcima (Sky in the Creeks) Biblioteka ,,Posebna izdanja", Knjiga 5, Vlastita naklada Đuretić, Zagreb, 2014. Work anthologised: Wind Five Folded, an anthology of English language tanka, compiled and edited by Jane  Reichold and Werner Reichold (1994); Four Seasons, an anthology of haiku poetry by season words, Koko Kato (1996);  Timepieces, Haiku Week At-A Glance, Los Angeles, CA, USA, David Prebe and James Hackett (1993, 1994, 1995, 1996); Haiku World: an international poetry almanac, William J. Higginson, New York, London, Tokyo (1996); Knots: The Anthology of Southeastern European Haiku Poetry, ed. Jim Kacian and Dimitar Anakiev, Red Moon, UK (2002);  Zen Poems, Manu Bazzano, MQ Publication Ltd., London (2002); Haiku, 10th memorial edition, Meguro International Haiku Circle, Tokyo, Japan (2004);  World Haiku,  No. 3, 4, 5, 6, 7, 8, 9, 10, 11, 12, 13, edited by Ban'ya Natsuishi, World Haiku Association (2007-2018); Seed packets, an anthology of flower haiku, ed. By Stanford M. Forrester, Bottle Rockets Press, Windsor, Connecticut (2010); The Scaldy Detail, an anthology of New Writing from County Wexford, ed. Eamonn Wall (2011); The Red Moon Anthology of English-Language, Red Moon Press, edited by Jim Kacian&the Red Moon Editorial Staff, Winchester VA, USA: nothing in the window (2012); fear of dancing (2013), big data (2014); Animal Rights Haiku Anthology, ed. by Robert Epstein, Middle Island Press (2016); Festival igračaka: Igračke (Toys), post-competition collection, Udruga "Tri rijeke" HPOI, Ivanić-Grad (2017); Beyond the Fields, a trilingual anthology (Punjabi, Hindi, English), edited by Sandip Chauhan, Ludhiana; Great Falls, VA, USA (2017); Haiku published in 25 issues of Samobor Haiku Meetings (1993 - 2018). city bus stop . . .
a falling star . . . Credits: "winter solstice" - The Heron's Nest Vol. 17, No. 3, Sept. 2015; "city bus stop" - The Heron's Nest Vol. 10, No. 4, Dec. 2008; "a short time" - Cherry Blossom Festival, Vancouver 2010; honorable mention; "oh, snail" - Shiki Monthly Kukai April 2014, 2nd place); "a falling star" and "full moon" - The 19th International Mainichi haiku contest 2015, honorable mention.